First of all, feed the waste plastics into the pyrolysis reactor. Secondly, burn the fuel materials (coal, or wood, or natural gas, oil) to heat the reactor. The reactor will be slowly heated, when the temperature reaches around 250℃, the oil gas will be produced. Thirdly, oil gas will be processed by our technology and then goes to cooling system to be liquid oil. The gas which cannot be liquefied under normal pressure will go back to combustion system. 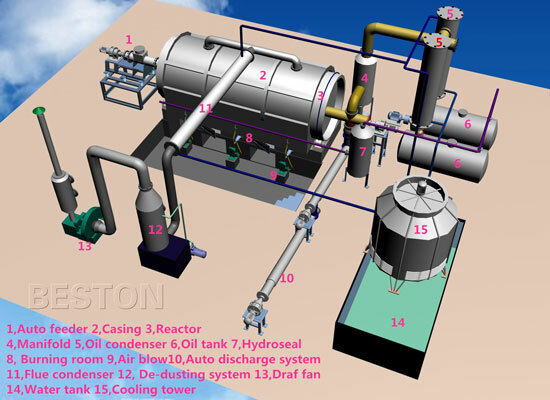 It will replace the fuel material to burn the reactor, which is energy saving and environment-friendly. Fourthly, after finishing oil production, the temperature of reactor will be down. When the temperature falls down to 40℃, we can discharge carbon black automatically. Lastly, the smoke produced from heating reactor can achieve national emission standard through the advanced dedusting system. Generally, we have two operating systems available for your choice, batch system and continuous system. 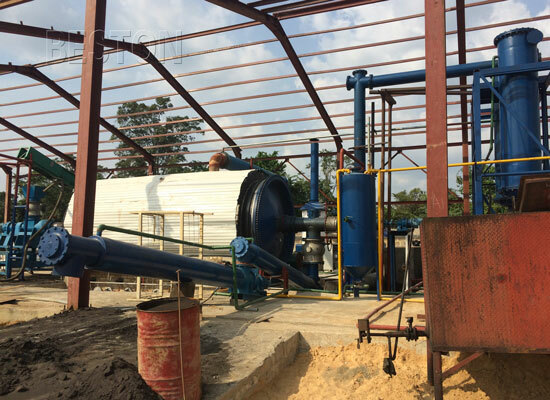 The plastic pyrolysis oil process is mainly different in three aspects. Firstly, for the continuous type, it is equipped with an auto-feeder, so the feeding of plastics is automatic. While for the batching type, the feeding process is manual. Secondly, the continuous type needs pretreatment devices. The continuous pyrolysis plant has a small feeding hole, so if the plastics are large and rigid, it needs shredder to crush the plastics. In addition, a dryer also needed if the water percentage of plastic is higher than 15%. While the batching system doesn’t need this device. Thirdly, the continuous type can work 3-4 shifts per day, while the batch type works 1 shift per day and the reactor must be cooled before the second batch. To satisfy various customers’ demand, we have 4 models available for your choice. BLJ-06 and BLJ-10 are batch operating systems; BLL-16 is semi-continuous system; BLL-20 is fully continuous systems. Besides, we can also customize the plant for you. No matter which set of plant you buy, you will surely get high benefits.